This privacy notice provides you with details of how North Mews Publishing Limited (trading as “Family Capital”), collects and processes personal data when either visiting our site www.famcap.com, clicking on an article, becoming a prospect or client, or becoming an employee of the company. If you are not happy with any aspect of how we collect and use your data, you have the right to complain to the Information Commissioner’s Office (ICO), the UK supervisory authority for data protection issues (www.ico.org.uk). We would be grateful if you could contact us first if you have a complaint so that we can try to resolve it for you. WHAT INFORMATION DOES FAMILY CAPITAL COLLECT ABOUT YOU? 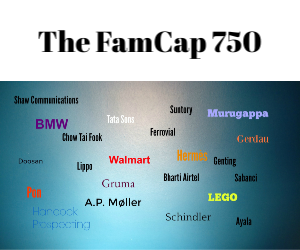 Please email us at contact@famcap.com if you need details about the specific legal ground. To manage a legitimate interest while in the recruitment process for job applicants and new employees. You can ask us or third parties to stop sending you marketing messages at any time by clicking on one of the unsubscribe buttons that are on all of our weekly Newsletter emails and marketing emails OR by emailing us at contact@famcap.com at any time. Where you opt out of receiving our Newsletter emails or marketing communications, this will not apply to personal data provided to us as a result of a product/service purchase, warranty registration, product/service experience or other transactions. Bitfender is installed on all PC’s and laptops as appropriate security measures to prevent your personal data from being accidentally lost, used or accessed in an unauthorised way, altered or disclosed. If you would like to exercise any of these rights, please email contact@famcap.com If you believe that we have not complied with your data protection rights, you can complain to the Information Commissioner. More information is available at https://ico.org.uk/for-organisations/guide-to-the-general-data-protection-regulation-gdpr/individual-rights/. A Cookie is a small text file containing information that a website transfers to your computers have disk for record keeping purposes. A cookie cannot give us access to your computer or to your personal information. Most web browsers automatically accept cookies; consult your browsers manual or online help if you want information on restricting or disabling the browsers handling of cookies. If you disable cookies, you can still view the information on our website, but the functionality of certain areas may be reduced.